Dive watch is probably the most sought type of watch in the industry, it is rugged to endure daily beating and suitable as a collector’s item due to better construction than many dress watches. Men could use it while swimming, doing sport, travel, and water sport or diving itself. The price of a dive watch range widely, from couple hundred dollars to thousands of dollars. An entry level luxury watch like Longines and Tag Heuer sell their dive watch around $1200-1800, while Omega, Breitling and Rolex sell dive watch from $4000-8000. Most people think Rolex is the most expensive watch available, but it couldn’t be further from the truth. There are few high-end watch (>$20000) brand like Audemars Piguet, Patek Philippe, Vacheron Constantine, Blancpain which also make various dive watch. But are they all the same? Of course not, and here’s why. 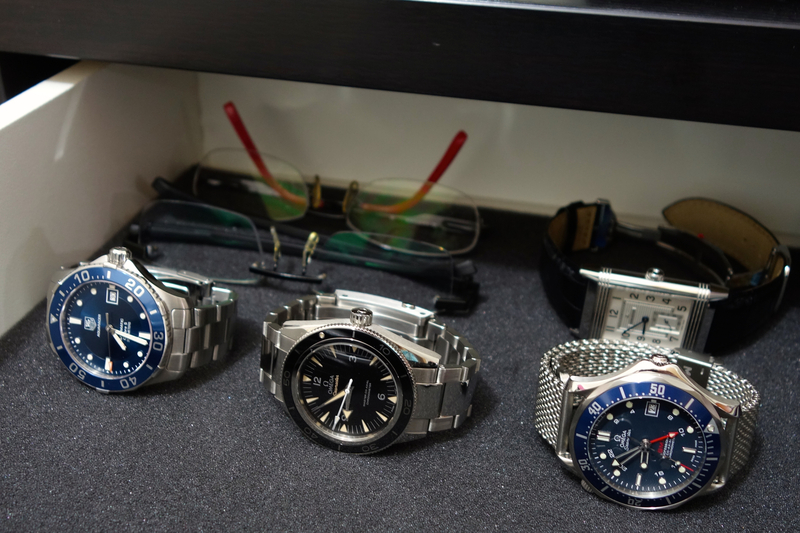 Currently I have three dive watches in my humble collection, an entry level Tag Heuer Aquaracer WAN2111 ($1600-1900), Omega Seamaster Professional GMT ($4200-4400), and Omega Seamaster 300 Master Co-axial ($4900-6600). My mother bought Tag Heuer for me when I was in high school five years ago and it serves as my daily beater for more than three years until I bought the first Omega. Tag Heuer Aquaracer is nicely built although the bracelet does feel light and cheap, it is water resistant to 300 meters, have unidirectional rotating bezel (120 clicks) and the “midnight blue” colour is great and unique specially when reflected by light at night. In five years of usage I never have any issue with mine and it hasn’t been serviced yet, keeping +6-8 seconds every day. I had use this watch for swimming, bathing, sports, and twice I did wear it on my wrist for 4 days straight even when showering and sleeping. Simply said, it is a reliable and affordable, quality dive watch. Two years ago I finally bought another watch, a diver from Omega inspired by James Bond movies by Pierce Brosnan, a Seamaster Professional GMT. Rated as 300 meters water resistant, unidirectional rotating bezel, and GMT function (so you can track two time zones simultaneously). Compared to the Tag Heuer I have, it is better build and heavier in a good way. It felt solid and the bracelet is very comfortable, although it is thicker than Tag Heuer, in Omega SMP GMT you could see the movement from the transparent case back. The bezel felt more solid, brushing work on the steel is better, and it has longer power reserve (48 hours vs 38 hours). Accuracy is between +4 to +6 seconds a day. Due to the GMT function I use Omega SMP GMT as my travel watch, it doesn’t attract many attention when you change the strap into NATO band or leather, but a WIS (Watch-Idiot Savant, a calling for watch collector) knows what you are wearing. 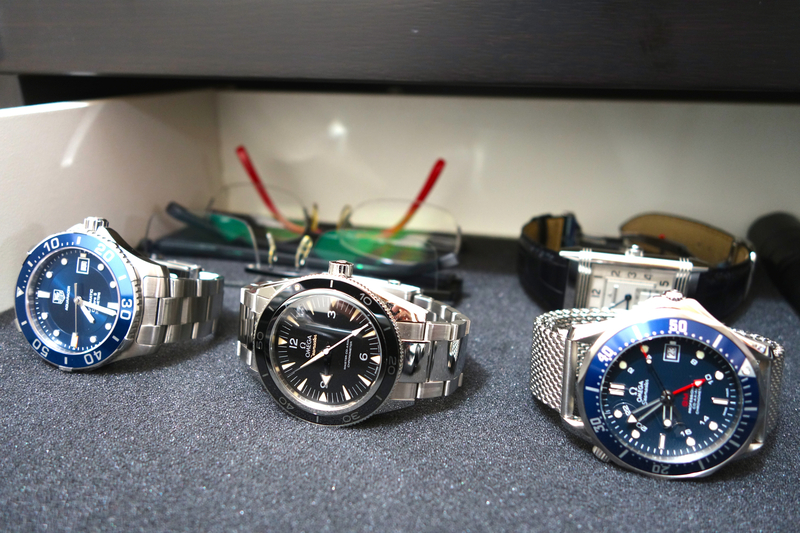 Earlier this year when I went to UAE, I bought another dive watch from Omega, a watch released at Baselworld 2014 that brings watch making to a whole new level. Omega Seamaster 300 Master Co-axial is a modern-classic watch made by Omega in 1957, the design resembles the vintage watch but the movement is an all-new master co-axial movement that is resistant to magnetic field up to 15000 Gauss and accuracy of 0 to +2 seconds a day. So far, this is the watch I’m proudest of having in my collection, the finished is certainly better than Tag Heuer and Omega SMP I have, and it is heavier but comfortable on my wrist. The watch also has a transparent case back so you can see the beautiful in-house movement with power reserve of 60 hours. The polished centre-link does attract attention (I’m not sure if this is good or bad), and sometimes I found miss the date feature (although design-wise, it is better this way). – More money you spend on a dive watch, you got better finished of the steel and brushing. – Spending more money on a chronometer watch is worth the price in long term. As I have said in the beginning, there are still more expensive watches than Omega and Rolex, but is it worth the price? I found the reverse to be true, take an example of Audemars Piguet Royal Oak ($21.000), although it has better (questionably challenged by Omega master co-axial) in-house movement and better finish, it only rated as 100 meters water resistant and the rest of feature are about the same. But of course, wearing an AP, PP($24.000), VC ($18.000), or Blancpain ($14.000) is arguably nicer and WIS respect you for your good taste and know where you come from. With that being true, should we ask ourselves why we bought a luxury watch? Is it because of the feature, history attached, or simply an accessories to show off our wealth? For those looking for the watch feature then an entry luxury watch may be sufficient, but for those trying to show off then you may want to have AP/PP/VC/Blancpain. This entry was posted in Watches and tagged 300 meters, aquaracer, Co-axial, dive, Master, omega, Professional GMT, seamaster, tag heuer, wan2111, Watch. Bookmark the permalink. 1 Response to Luxury Dive Watch: Is it all the same?